The Governor of the Bank of England, Mark Carney, and the Managing Director of the IMF, Christine Lagarde, both made important contributions recently to the debate on the importance of addressing inequality. They spoke about how inequalities are leading to worrying trends in the erosion of trust and solidarity, with Lagarde saying that, “it hinders people from participating fully and developing their potential,” and that the IMF’s own research showed poorer economic performance in countries with wider inequalities. What was important about these speeches was that, as heads of two of the most powerful economic and financial institutions in the world, they directed their remarks at a meeting of the financial sector in London. Getting this sector, so prominent a part of London’s economic life, to understand that something societal has to change and that they need to be part of the solution is an important step forward. It is not only the financial sector that needs to play a role, London is asset rich in many ways, not just in terms of the people who live here. It also has many economic, social and cultural assets that are enjoyed widely by many, but unfortunately not by all. The figures are stark. In terms of economic assets, 30% of London’s children live in poverty. They are often housed insecurely within touching distance of those who enjoy the city’s riches. It is no surprise that compared to similar cities across the world we do poorly on a range of health indicators. The impact this lack of connectedness, between the assets that are close by and the health of some of the population is well documented. The point though, is not just to describe this picture but to do something about it. The wellbeing of London is dependent on all Londoners being able to contribute their talents and thrive. We have met some amazing voluntary organisations and funders of very old charities in London who are working to release people and funding assets to many areas of need. We are not fully connected within London on this – the public health and health care systems at times work in parallel rather than in complementary ways to these endeavours. The stakes are high and we need to be much more joined up as a whole city. London needs to offer a high quality of living for all, not just some, of its residents. Good quality affordable housing is an example of this. Moreover, addressing inequality is not harmful to the economic well-being of London, but as Lagarde points out, it would actually help it. London could achieve even more if all of its population contributed. Local government understands this and are showing great strength in their leadership of the new health and wellbeing agenda. Going further means harnessing new thinking in broader coalitions and linking people to London’s assets. This is the approach we are advocating as part of Lord Darzi’s review of health and health care in London. Commissioned by Boris Johnson, it will make recommendations in the autumn on what role the office of the Mayor can play in securing good health for all, complementing the existing work being effectively led by boroughs, the voluntary and charitable sectors and the NHS. Business has a positive role to play for its workforces too. The work itself is already unearthing a real appetite to move the city from a concern about London’s health services to a positive movement for people’s health. The starting point is Londoners: who they are, what they think, how they live their lives and what support the need and want. It aims to get to the heart of how we nurture the assets we have and connect more people to those assets. In conversations with stakeholders and experts, this in coming up strongly and we sense a real change in how people are thinking about health and what role they could play in shaping a healthier city for all. This is exciting and challenging territory. It is challenging in terms of deciding where to focus action so we achieve real change. It is challenging in fostering new ways of thinking and working with new partners, where understanding and experience often differs. It is challenging in an environment where resources are finite. More disadvantaged communities can be linked to the other assets London has, recognising that all communities themselves have some of the solutions if supported. All of this implies a shift in power towards local communities, people and patients. PHE London is up for this leadership challenge. It is not one we will shoulder alone: local government and others are already playing their part. Trusting in our joint leadership, we believe that innovation will come from providing the right environment for it to flourish and that London can start to take practical steps to address one of the huge challenges of the age. Inequalities are neither inevitable nor, as the heart of the financial sector recognises, desirable for any of us. 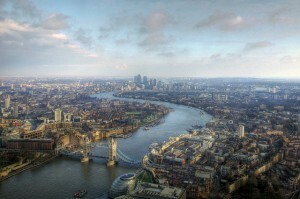 Featured image "London bird view" by Mariusz Kluzniak. Used under Creative Commons. I can think of no better person to lead the challenges you set out. You are close enough, social and emotionally intelligent enough, and above all fcommitted andf focused. I think you are absolutely right on the environment, and when we get this right, we can move at speed and with significance. I think the communication is also a key, and not just communicating with the more easier to access people and groups, the communication to and with needs to be with people who we are not reaching very often not reaching at all. A great many people know you do deliver, and do make a difference. So true Bren, hope you're having a lovely day!